Amaravati: Amid speculation that a CBI inquiry may be ordered into allegations of corruption against him, Andhra Pradesh Chief Minister N. Chandrababu Naidu on Friday told TDP MPs that a 'conspiracy is being hatched against us'. The Telugu Desam Party (TDP) chief advised MPs and other top party leaders to remain alert and be prepared to face any difficulties. 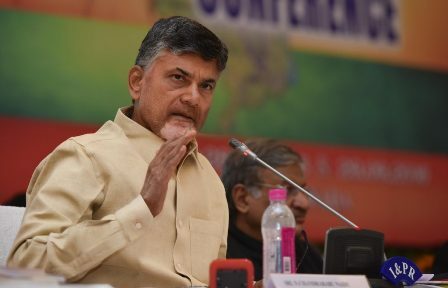 In a teleconference with party MPs to take stock of the developments in Parliament, Naidu again voiced his apprehension that the BJP may target him, his son Nara Lokesh and other TDP leaders by slapping cases as they have pulled out of the National Democratic Alliance (NDA). The TDP chief also alleged that the BJP was trying to weaken the political leadership in south India. He said since a strong TDP means a strong Andhra Pradesh, attempts were being made to weaken the party by using the YSR Congress Party and Jana Sena. Naidu had earlier accused the BJP of trying to politically destabilize Andhra Pradesh by repeating what it did in Tamil Nadu. "I have come into politics to serve the people and not for conspiracies and machinations. This should be kept in mind by the three parties," he said referring to the BJP, YSR Congress and Jana Sena. Naidu's comments came in the wake of all the three parties making allegations of corruption against the TDP government, targeting him and his son Lokesh, who is also a cabinet minister. On Thursday, BJP leader Vishnu Kumar Raju alleged that TDP government was involved in corruption in the Pattiseema project and cited the report of Comptroller and Auditor General (CAG). Speaking in the assembly, Naidu made a counter attack by claiming that same CAG found fault with the Modi government on many issues. Naidu also slammed the three parties for making similar allegations on Polavaram project. "There were no corruption allegations when we were in NDA. How could we suddenly become corrupt after leaving the NDA?" he asked. The TDP pulled out of NDA over the latter's refusal to accord special category to Andhra Pradesh and fulfill other commitments made at the time of state's division in 2014. The TDP has also moved a no-confidence motion against the Modi government in the Lok Sabha. It could not be taken up due to unending uproar in the House. தமிழக முதலமைச்சர் பெரும்பான்மை இழந்து விட்டார்!